“Mandela! Mandela! Nelson Mandela!…… Mandela! Mandela! Nelson Mandela!… Free… Free… Nelson Mandela! Free… Free… Nelson Mandela!” as we shouted slogans and walked through the college verandah showing solidarity to the international community demanding the release of Madiba.. we were being part of an international outcry…. It was not the lecturer’s fault… I was probably a wrong student sitting in a science class thinking of politics, Arts and humanities…. Again you never know where life takes you…. But a thing did happen when college ended and life started its different course… I realized that freedom is much beyond what we could express in words…. we cannot truly talk about it unless we have experienced not having it…. So what I learned is that you don’t have to be on the path of a huge freedom struggle to understand the lack of it in the people we daily meet… Freedom is key… some can’t live without it and are suffocated… but there are even many who don’t understand that freedom is being questioned and think it is a norm of life.. so it is a whole different idea and much more than what I foolishly commented in my mind to my lecturer…. A realization that made me look at the ideologies I felt close to and shape it in my mind in order to knock off and wipe off any walls or boundaries that the continuous following would have built around me…. Growing up in India sadly I never saw Gandhi as the icon of Freedom struggles… he had become more of a symbol of a political sect…. I had to leave India to really discover Gandhi and his relevance…. 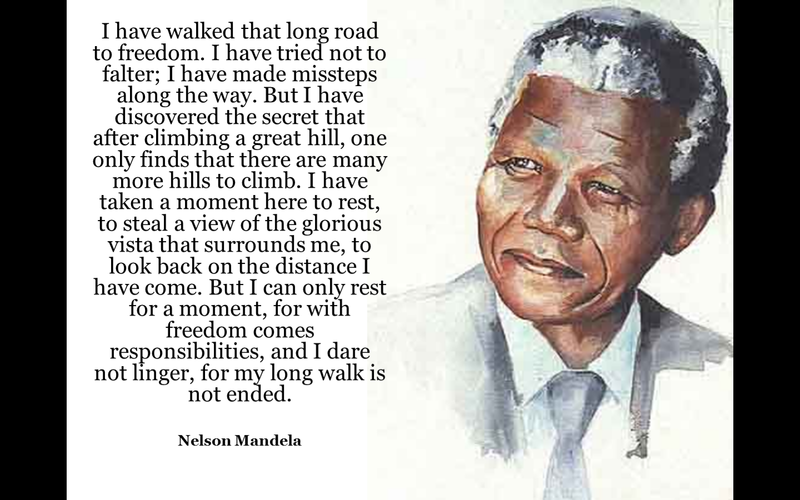 So living in a country where the small swift remarkable man in a loincloth marched a whole nation towards freedom, for me Madiba was the epitome of freedom struggle where I raised my voice first so someone could gain their freedom…. May be also because we lived during the same time… Gandhi was History, read in books and seen in newsreels before movies… but Mandela was happening now… he was the present and the Future…. And now sadly he is in the past…. There is a truly a sense of loss… beyond this post….